This massive tower (250 feet) fed a number of paths. One path stretched to Riverton, Utah, and from there to Payson, Utah, and south. Another one went to the top of a nearby mountain (AT&T Bountiful) and northward. 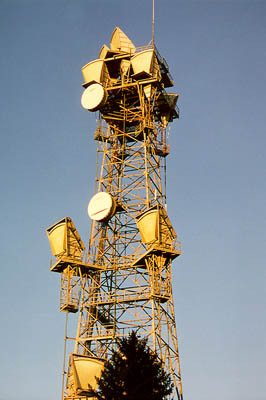 Several other circuits went to the local operating company (US West) building downtown; another connected this tower to another tower at Pratt's Pass, and from there into the east-west circuit across Wyoming. The other paths are pointed westward, to the AT&T site on Stansbury Island in the Great Salt Lake. The circuit went westward from this location through Stansbury, and across the Great Salt Lake desert, to Barro, Wendover, and across Nevada and Northern California to Oakland. 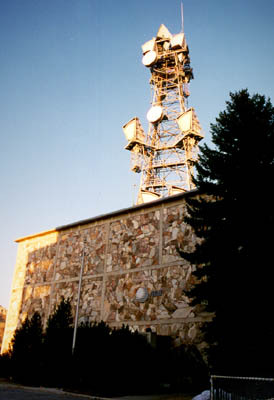 Nestled at the side of the Wasatch Range, at the mouth of Salt Lake City's Emigration Canyon, and with the tower building faced with native rock, this tower sits to the side of a large base building. The parking lot appears to be set up for around 20 cars. Information from an engineer at Cingular Wireless suggests this tower is largely idled and the building is mostly unused. A note from Terry Michaels took me to the August 1952 edition of Bell Laboratories Record, which has an early picture of this tower, back when it had just four antennas, two facing Pratt's Pass, which the article noted was the shortest link in the transcontinental Microwave circuit, at just under 10 miles, and two facing westward towards Stansbury. The antenna has changed dramatically from those early designs. Terry notes that the transcontinental Microwave circuit this tower was a part of began operation on August 17, 1951. 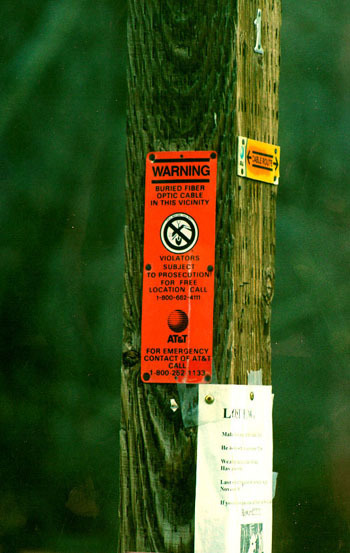 Signs surrounding the tower indicate the presence of a fiber optic circuit, and older signs show evidence of the transcontinental cable circuits of years past. Truly a beautiful piece of engineering, from the time when AT&T Long Lines ruled the airwaves and The Bell System was the only game in town. 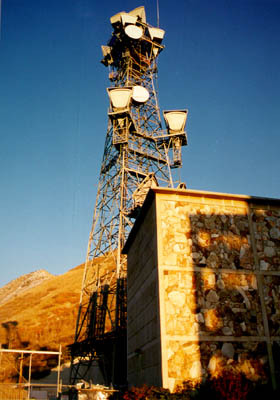 The 250 ft. tower is sited against the Wasatch Mountains, at the mouth of Emigration Canyon. 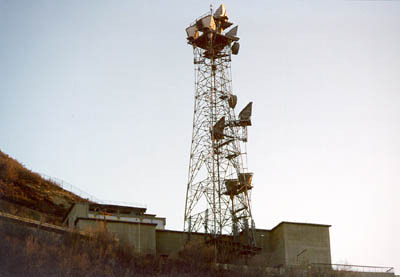 The large base station appears to be at least 3 floors above the ground. (view from the northeast). An interesting thing, although it might be an illusion, is there seem to be windows at the top rear of the stucture. I've got to go back and take a look someday. Certainly, this site has one of the most spectacular views possible of the Salt Lake City Valley. View from NE. Click Here to find out how you can help keep this website alive!